As a shareholder you've got to be fairly optimistic about your company's prospects; expecting that its shares will produce a better return than its bonds. In contrast, bondholders can be pessimists; as long as the company or government generates enough money to pay the interest they'll still be paid even if the shareholders are having a hard time. They say shares are for optimists, bonds are for pessimists. I am still fairly optimistic on equities which is why I continue to maintain a 60:40 balance but there’s no harm in hedging your bets and bumping up immediate income with fixed interest, higher yielding trusts. It is almost two years since I purchased this IT for my ISA as a replacement for a few sales from my shares portfolio. They have this week announced final results for the 12 months to 31st December 2016 (link via Investegate). Net assets have steadily increased over the year and taking the full year dividend of 10p per share into account, the total return was 11.8% (2015 2.7%). The dividend target for the trust is 10p per share paid quarterly. This amount was paid in 2014, 2015 and 2016 and remains the target for the coming 12 months. At the current price of 190p the shares offer a yield of 5.2% which is obviously attractive compared to the rates on offer from our banks and building societies. The average cash ISA rate is currently a miserly 0.8% according to latest figures from Moneyfacts. In 2007, the average rate was 5.0%. 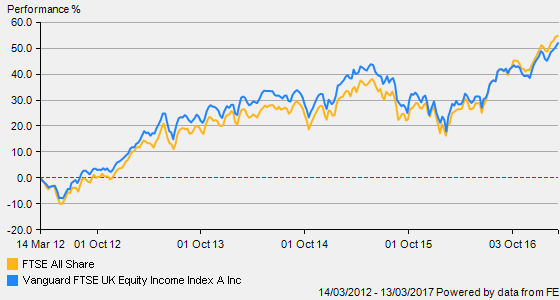 For me, the trust provides some diversity to equities and a steady and predictable quarterly income stream. I was pleased to receive an email from my ISA provider AJ Bell this week to flag up the launch of their new range of passive funds from April. I guess as the rise of passive index funds goes from strength to strength, it makes a lot of sense for the platform to offer a ready-made option for their customers. AJ Bell are offering a range of 5 funds which are a mix of equities, corporate bonds, gilts, property and cash. Each fund will hold a blend of underlying funds/ETFs from the likes of Vanguard, Blackrock, iShares and State Street etc. The offerings range from cautious to adventurous and the corresponding equity levels start at 20% then step up to 30% for the moderately cautious, 40% for the middle option, 50% for the next step through to 60% for the higher level - so not overly adventurous. I think the weighting for UK equities is less than the Vanguard Lifestrategy funds however, I was a little confused to see they seem to use 2 options for the S&P 500 - iShares ETF and Source ETF. The bonds comprise a mix of gilts, corporate bonds and high yield bonds. The total percentage of bonds is 60% for the cautious and falls to 20% for the adventurous. The portfolios also includes a percentage of property and cash across all options which my Vanguard Lifestrategy range does not offer so this could be good for those investors who require a broader mix of assets. I was a tad disappointed to see the relatively high figure of 0.50% for ongoing charges - certainly high compared to the Vanguard funds at 0.22%. To mitigate, there is no charge on purchase and until 2019, AJ Bell will not levy their usual 0.25% custody fee. Would it not have been possible to consolidate the underlying charges of the funds/ETFs together with a small admin fee to make a total of, say 0.4% and waive the custody fee permanently? …just a thought but possibly not practical. Apart from the higher charges, which will take away from returns over the longer periods - I welcome this offering from AJ Bell and will certainly bear them in mind when the time comes around reinvesting some of the cash from various sales in recent months as the markets have risen. Index investing is becoming very popular but of course, whatever index you follow, they are not immune to the bear market so however tempting the offering I will leave my cash in cash for a while longer. The funds should be available from 19th April. I am not an economist - far from it, but one thing that niggles away at the back of my mind is our ever increasing debt and how this may impact on society in the future. How can we afford state pensions and welfare provision when they seems to increasingly rely upon borrowing the money to fund them? 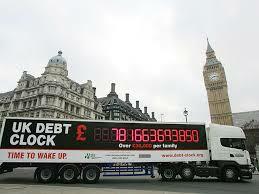 Our national debt is the total amount of money borrowed by our respective governments. It is mainly created by the issue of government loans called gilts which are purchased by the Bank of England, the private sector such as insurance company pension funds and also other governments from around the world seeking a safe home for their money. The debt currently stands at £1.7 trillion and has been increasing year-on-year since 2001 when it stood at just £300bn. 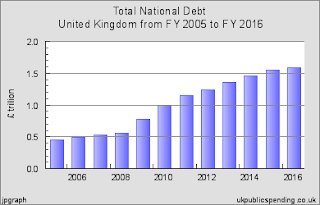 The amount we borrow each year peaked just after the financial crisis at £150bn in 2009/10 and has been steadily declining each year however we are still spending £50bn more than we receive.The deficit is predicted to fall to £20bn by 2020...that's £30bn more than was forecast in 2016 - the goalposts seem to keep moving. The politicians are quick to assure us that the deficit is falling but slow to point out that the total debt continues to rise. Like all borrowers, our government has to pay interest on the debt it creates. In 2001 we were paying around £20bn per year in interest and we are now paying around £39bn which represents around 5% of total spending and more than we spend on the likes of social service or transport. Since 2007, bond yields have been falling which means the interest on the debt has been lower than it would have been. 10 Yr gilt yields are currently around 2%. However, this could easily reverse which would result in higher debt repayment costs. Having paid into the system for the past 45 yrs, I will finally become eligible for my state pension next year - whoo hoo!! I am not overly concerned about the governments ability to continue with state pensions in the shorter term. 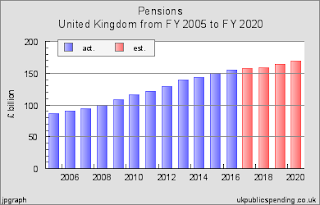 However, unless there is some signs that UK plc will start to live within it’s means PDQ, I do wonder whether the universal state pension can be afforded in its present form for those starting out today. 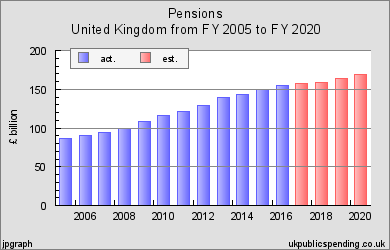 Spending on pensions has doubled in the past 10 years to £157bn and this dramatic rise looks likely to continue. The combination of far more people living longer and the squeeze on welfare provision could create quite a toxic time bomb down the line. When I was looking at research for my book ‘DIY Pensions’, I was a bit surprised to see that around half of all workers had made no private pension provisions and would be solely relying on the state pension. Of the remaining 50%, the average pension pot was only £35,000 which obviously will not provide much additional pension - £100 per week at best. The government have been trying to cut back on public expenditure in recent years with their so-called austerity measures but they are having to increasingly implement spending priorities - NHS, Welfare etc. and the debt is still rising. With an ever increasing population, people living longer and all the uncertainties of leaving the EU, the pressures are building. If this continues, which is clearly more likely than not for the foreseeable future, there will be a point where a future government will question whether it can continue with universal pensions for the relatively wealthy when more money is needed for social services and pensions for those who have no other provision - in other words, some form of means-tested cut off point. I am not saying this will happen, merely that it must be a possibility. It will therefore be incumbent for those younger people to prepare for such a possibility and take saving for their retirement much more seriously. Yep, I will second that…. What do you think - leave a comment below and share your thoughts with others. This property REIT was added to my income portfolio last October following a placing of shares at 132p. 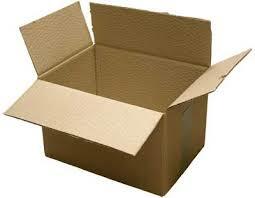 Tritax Big Box was first listed at the end of 2013 at an initial floatation price of 100p. During 2016 it raised £550m of equity through two substantially oversubscribed share issues. They have today issued results for the full year to end December 2016 (link via Investegate). Total Shareholder return for the period was 15.1% which compares very favourably to the FTSE All-Share REIT Index return of -7.0%. The company target a total return (being the increase in EPRA NAV + dividends paid) of 9.0% per year - the figure for 2016 was 9.6%. Building on payouts for the previous two years of 4.15p in 2014 and 6.0p in 2015, the declared dividend for the full year 2016 is 6.20p rising to 6.40p in the coming year. At the current share price this provides a fwd yield of ~4.4%. The company are now moving to quarterly dividend payments. The Group's dividends are fully covered by adjusted earnings of 6.51p, which are underpinned by strong rental stream and low cost base. "The outlook for the Group remains positive. 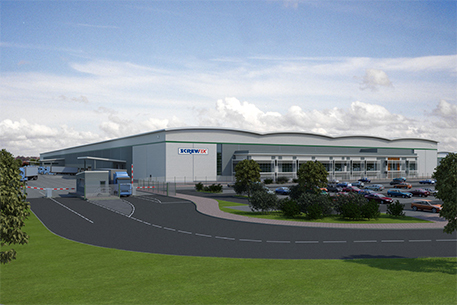 We are in a strong financial position and see further opportunities to acquire high-quality standing assets and to forward fund pre-let developments. We consider there to be limited potential for capital growth through further yield compression and whilst more challenging, we have maintained a 9% per annum total return target. Capital growth is therefore likely to come from steady state capitalisation rates being applied to growing income. We believe that income will remain the most important component of total return over the next 12 months. There are strong drivers to rental growth in the market, both due to the ongoing imbalance between occupational supply and demand and the increase in build costs in 2016, which we expect will feed through to rents. This rental growth will help to support the Group's progressive dividend policy. For 2017, we have increased our dividend target to 6.40 pence per share. In uncertain times, investors are often drawn to companies that can deliver low-risk and growing income. Since our IPO, we have deliberately constructed a portfolio that offers secure income from high-quality tenants on long leases that generate an element of predictable growth through upward only-rent reviews. In summary, our market is resilient and we expect 2017 to be another positive and stable year for the Group." My grandchildren would prefer this big box! I am pleased with this recent addition to my income portfolio. The share price has gained 13% compared to the offer price of 132p last October. In addition, I have received a dividend of 1.55p and the prospect of 6.4p for the coming year. 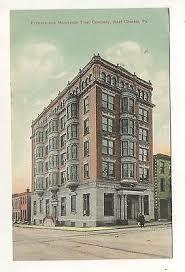 The demand for the BIG boxes offered by this REIT is likely to remain strong. I may well be looking for an opportunity to add to my initial purchase over the coming year. Therefore, in future, I will flag up all blog articles and related matters on this new feed.